Located at Super Highway Chiang Mai - Lampang in the district of Sai Mai district. Chiang Mai The area is about 556 acres, 99 square meters, the site of the administration building, building, building Ecclesiastes Genesis Church Building Sirindhorn Learning Resource Center. Building fair Stream Office buildings International Brotherhood Building Homes Dormitories Omega Alpha female dorm Building of the Faculty of applications. 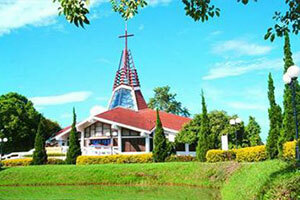 Payap University has a long and rich history beginning in 1888 with the founding of the Thailand Theological Seminary. That seminary has now been integrated into Payap University as the McGilvary College of Divinity, one of eleven academic divisions comprising the university. Initially, seminary students were accepted after completing elementary school. High school graduation gradually became the pre-requisite for a seven-year bachelor of divinity (BD) course that was formally initiated in 1960. The second predecessor of Payap University was the McCormick Hospital School of Nursing, established in 1923. After first accepting students with minimal educational qualifications, in 1961 the School of Nursing made high school graduation a pre-requisite for entrance. Degrees awarded by these institutions, however, were not recognized as college degrees by the Royal Thai Government. The Royal Proclamation of the Private Colleges Act of 1969 made private higher education a legal reality in Thailand. The Thailand Theological Seminary and the McCormick Hospital School of Nursing initiated discussions to set up a private college. Together with representatives of the Church of Christ in Thailand, the American Presbyterian Mission, and the Disciples Division of Overseas Ministries, they formulated articles of incorporation which were submitted to the Royal Thai Government. Payap College received accreditation on 21 March 1974, and became the first private college in Thailand outside of greater Bangkok. The first class of 204 students was accepted in 1974 and 154 students were graduated at the end of the 1977-78 academic year. Since that time thirty-two more classes have completed their course of studies; there are over 31,000 alumni of the university. In its early years, Payap College operated in borrowed facilities. Originally there were two campuses, one adjacent to McCormick Hospital and the other five miles distant, a four-acre site on the west side of Chiang Mai, on which stood three residential buildings. Although initial plans called for the development of these two campus sites, it soon became evident that expansion of the four-acre western site near Chiang Mai University was impractical; skyrocketing real estate costs precluded additional land acquisition at that site. The eastern campus, opposite McCormick Hospital, strained to accommodate adequate facilities for both student and graduate nurses of the hospital and the students of the Thailand Theological Seminary. Although additional buildings on this 16-acre site would have been possible, facilities for the anticipated student body of several thousand students could not have been accommodated. The Board of Directors, therefore, voted early in 1974 to proceed with acquisition of land in a more favorable location, two miles to the east of the McCormick campus (now called the Kaew Nawarat campus). About 120 acres of low-lying land were then acquired; this site now comprises the Mae Khao campus, which serves as the main university campus. Subsequent land acquisitions have increased the size of this campus to approximately 275 acres. Payap's achievements were recognized by the Royal Thai Government in 1984 when it became the first fully accredited private university in Thailand. Since then the university has continued to progress, expanding facilities to accommodate the steady growth in the student body, investing in the continuing education and training of the faculty through university support of graduate education in the US and in other countries, and adding a wide range of international programs to attract students from across Southeast Asia and from other areas of the world.